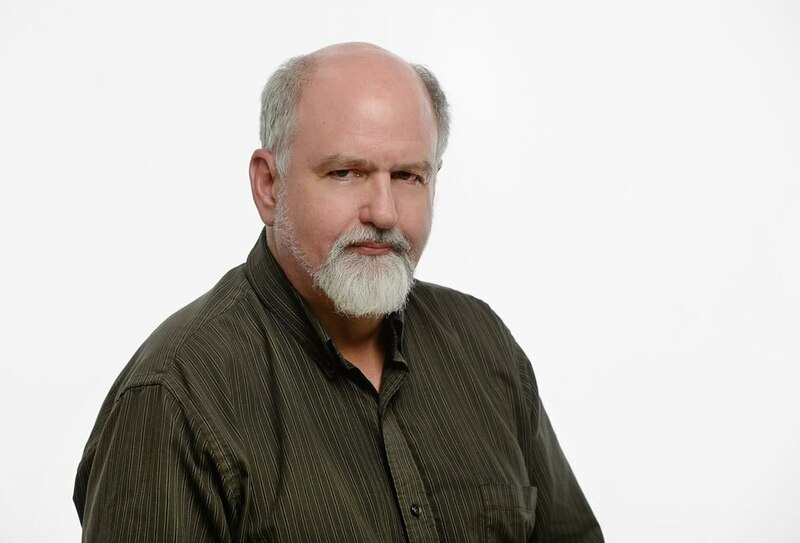 George Pyle: What would Jesus do if he weren’t Jesus? 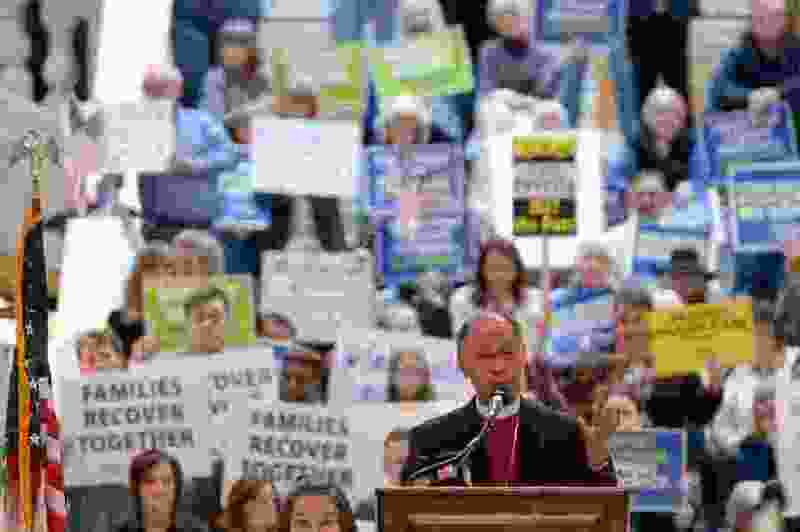 (Francisco Kjolseth | The Salt Lake Tribune) Bishop Scott Hayashi, Episcopal bishop and original sponsor of the Prop 3 initiative takes to the podium on Monday, Jan, 28, 2019, in the Capitol rotunda on the first day of the Legislative session to rally in support of protecting Proposition 3, the Medicaid Expansion law recently passed by voters. A man is sitting on the roof of his humble home, escaping a rising flood that has devastated his community. A National Guard amphibious craft comes by and calls out to the man to climb aboard. “Suit yourself,” says the soldier, and the boat moves on. A while later, the floodwaters are even higher, and a sheriff’s deputy in a rowboat comes up to what still shows of the house. He calls out to the man to come aboard. “OK. Fine,” the deputy says, and he rows away. A while later, the floodwaters are up to the man’s chest. A neighbor in a rubber raft drifts by and offers the man a final way out. The neighbor and his raft are swept away before anything more can be said. People of all political parties and ideologies have been known to exhibit contradictory feelings about how people motivated by religion get involved in politics. If the particular churchy people agree with you, then they are “faith-based” and deserve praise for working to put their humanitarian beliefs into action. If they don’t agree with you, then they are a modern Inquisition, meddling in things that are none of their business and trying to force their superstitious beliefs on other people. The other day a member of the Utah Legislature got in a Twitter flurry of trouble when he popped off at a group of local religious leaders who joined in a plea for the survival of Proposition 3, the voter-approved measure that would finally provide a full expansion of Medicaid in the state. As is the nature of the beast, McCay’s tweet whirled around the mobile Internet, picking up some support as well as many 280-character expressions of displeasure. McCay sort of walked back his tweet. “I’m sure none of these leaders prefers to turn to the government and wishes, like me, that our religious tenets would solve all problems,” McCay wrote. For all the grief he had to put up with, there is no sign that McCay learned anything. Except maybe not to tweet while under the influence of politics. The idea that religion, any religion, can solve problems of poverty, inequality, lack of access to health care or housing or other basic parts of a decent life is not grounded in fact or in any modern belief system. Religion has always motivated many good people to look around, see suffering and pain, and wonder, What would Jesus do? Everyone who isn’t Jesus has to resort to less magical, more human, tactics. Like petitioning their government for a redress of grievances, grievances that include the shame of living in a society where children are homeless and where good, honest people can’t afford to go to the doctor when they are sick. Much less go to the doctor to keep from getting sick. Religious organizations and orders have always run orphanages, hospitals, shelters, soup kitchens, schools and all that good stuff. But, unless we want to live in a theocracy, where the church has the power to tax everyone or otherwise force the populace to support those and other humane operations, no religion has the wherewithal to do what needs to be done. At least no power beyond what everyone else has, to organize, to speak out, to demonstrate, testify and vote, pushing and pulling to turn society into something they, and everyone else, can be proud of. That takes the collective power of our government, carrying out the will of its citizens, religious and otherwise, who often seek the same outcomes even if they come to it by different paths. It doesn’t matter whether God or the National Guard sent the boat. If the water is rising, get in.